IN December 19 the Star announced water supplies in the Lisburn and Hillsborough areas were not unduly affected as the result of a burst water main in the Deneight area. The burst was discovered on the Saturday morning where householders found water in their taps had turned a brownish colour due to the burst in the main. But it was all cleared up after men from the Hillsborough Rural Council worked the whole day to carry out the necessary repairs on the 24-inch pumping main. This was completed within 12 hours. Moira man exhibits in Australia On Saturday the 19th of November 1958, The Ulster Star reported that Mr Noel Adrain, a keen amateur photographer of Hillsborough Road, Moira, has recently been invited to exhibit prínts in the Maitland International Salon of Photography Exhibition, which was to be held in Sydney, Australia, in March next year. Mr Adrain has been interested in photography for the past seven years and the previous year decided to send some prints for exhibition in Australia. Since then he has been invited to exhibit at Melbourne and Brisbane. As entries for the Maitdand Exhibition did not close until late January, Mr Ad-rain has not yet submitted his prints but they would probably be landscape and architectural shots, in which he specialised. Mr Adrain, who was a member of the Lisburn Camera Club, had shown photographs at Royad Photographic Society of Ireland exhibitions. Ulster Star reader Desmond McKee has brought this old photograph to our attention to see if any local readers can provide any information about the photo or those who are in it. Desmond discovered the photo along with his brother-in-law William Coates' belongings after William passed away two years ago. 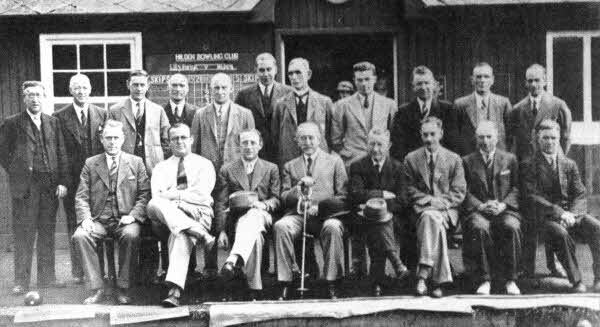 Desmond does not know who the group of gentlemen in the photo are, other than Sir Milne Barbour (front row, fourth from left) and that it was taken at Hilden Bowling Club. Do you know who these people are and what they were doing? Can you tell us when the photo was taken? If you have any information contact the Star office on 92679111, email news@ulsterstar.co.uk, or you can contact Desmond on 92601728. IN November 1958, The Ulster Star reported that Lady Wakehurst was at Friends School for the annual Speech Day. The special guard of honour was selected as Lady Wakehurst was the president of the Ulster Girl Guides. Another visitor for the speech day was Mrs. W. E. Greeves, MBE, the chief commissioner. The entire school, together with many parents and former pupils, had assembled in the building when the platform party arrived and made its way to the stage. In the annual report, the head master, Mr. C.I Gray, criticised parents for failing to show the same interest in their children education after the 11+ examination as they did before it. Giving an example of the lack of concern shown by parents after children qualify, Mr. Gray said that last year, he suggested that parents should get in touch with the school not later than the year in which their children sat the junior certificate examination, for discussion and consolation about future plans, choice of subject for senior certificate and possibilities for a career. During the summer term, in an attempt to make this a practical possibility, the parents of all the fourth form pupils- a possible audience of 150 - were invited to attend a meeting where the mysteries of senior would be unfolded and teachers would be available to suggest advice about the choice of employment, qualifications required, length of training and most importantly individual suitability. Only 30-40 parents accepted. 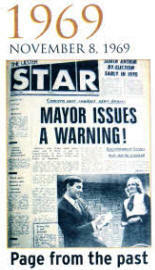 IN 1958, The Ulster Star reported that long term plans for the Lisburn-of-the-future, which included the demolition of practically every home lying south of Market Square and Bridge Street, had been passed by Lisburn Urban Council and were before the Ministry of Health and Local Government for approval. at a special meeting of the council who were told 4,900 houses had been surveyed in the town. Of these, 1,570 were found to be unfit for human habitation - almost one third of all the public housing. The council was told 1,130 could be made fit to live in as a reasonable cost, but 440 houses would have to be demolished. Where there were larger areas of unfit homes, it was suggested that clearance orders should be issued, even though these areas would include some sound houses. Clearance areas made as a result would be easier to deal with administratively than a lot of individual orders. This was a shop familiar to many people down the years - Irish Yarn Industries at Harry's Road. 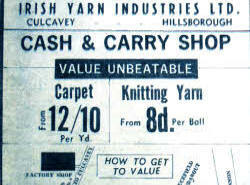 In 1969 carpet was 12/10 (less than 60p) a yard. This portion would include 200 houses, of which 170 were not worth repairing. of unfit houses, and the only satisfactory way of making a real job was to include them in the clearance order. In a separate development the same year, Moira Rural District Council was told that of the 944 houses in the villages it covered, 154 were 'totally unfit' and incapable of being fib made fit at reasonable expense. IN 1958, The Ulster Star reported Strollers beat Hilden 5-3 at Barbour Playing Fields. Hilden, who were forced to play with 10 men for most of the 1st half, were unlucky not to go in front early in the match but it was Strollers who took the lead. Two defensive mistakes allowed Strollers to score twice in as many minutes. The marksman was O'Neil who was playing in the unusual position of striker and showed up well. Although Strollers could be said to have a upper hand at this stage, it was obvious to see they were missing their free-scoring striker Phil Philips who had scored 30 goals up to date. Despite Hilden's defence playing stubbornly against the Strollers' attack they could not prevent their' adding the third through Mercer. Then Humphries got Hilton's first goal with a good strike from the right wing. After half time Humphries gave his side a great chance by scoring a fantastic goal from 30 yards to make it 3-2, but the Strollers restored their 2 goal margin when Topping raced clear to score to make it 4-2. After that Hilden threw everyone forward in search of a goal and got one when Shirlow found the net to make the scoreline very close at 4-3 but the Strollers ended the scoring when Mercer scored after a lovely pass from Topping who was playing very well. Overall Strollers just deserved the points but Hilden could hold their heads up high.